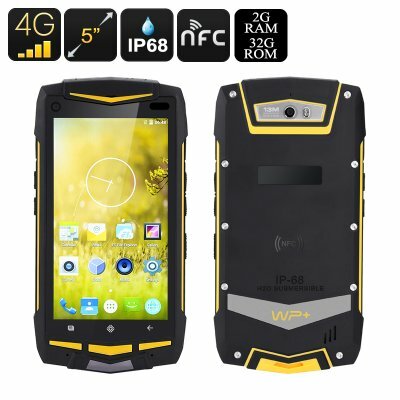 Successfully Added Android 4G Rugged Smartphone - 4G, 5 Inch Screen, Qualcomm Snapdragon 615 CPU, NFC, IP68, 2GB RAM, Walkie Talkie (Black) to your Shopping Cart. Coming with the highest protection rating, this rugged phone is IP68 waterproof. What this means for you outdoors? It means that this phone is totally dust tight and can be immersed in water for up to 1 meter. So, feel free to take the rugged phone along on a hiking or camping trip — no matter the weather conditions. The smartphone even comes with a barometer that will help you predict weather changes and make informed decisions about your trip. The 4G rugged smartphone comes with NFC support — a great feature for exchanging files on the go with other compatible devices. The 3720mAh battery gives you up to 6 hours of non-stop talk time or about 70 hours on standby. The Android 5.1 Rugged Smartphone comes with a 12 months warranty, brought to you by the leader in electronic devices as well as wholesale Android rugged phones..